Fry, sear, scramble, and saute all of your signature dishes in this versatile 10" aluminum fry pan! With a shallow, curved wall design, this pan allows for easy stirring and prevents steam from forming in the pan. High quality, evenly heating aluminum frying pan. 10 inches is the perfect size for most single serve pasta and veggie dishes. Not easily warped and very easy to clean. These pans are perfect for sautéing fajitas, making quesadillas and omelets. I would highly recommend, they are a sturdy product!!!!! I just really love these pans, i eill sure by more from here in the near future. These are the best! I use them when we go camping to cook breakfast on the way! The kids love them. They are easy to clean and pack well! I bought a few extras for my kids to take to college! This is my favorite fry pan. It is really well made and you can feel it’s quality as soon as you hold it in your hand. These pans are well worth the money. They are a nice thickness but not to heavy. I feel like they will hold up nicely in our restaurant! No problems so far. Has worked well with no issues. Is what was expected based on description. Good for the price. Will order again when needed. Third time buying these pans, they work well, we do very heavy saute so i don'e mind spending the money every year to get new skillets, we turn 70 skillets 4-6 times a day 7 days a week so i get my money's worth . Excellent product, will definitely recommend to family and friends. Very good price, quality, light weight, and good for a busy fast moving environment. Will order more in the future. 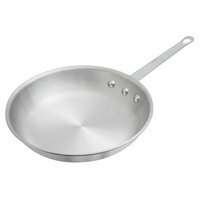 This pans really good price and easy to use. I really like it. I bought different pans to but this one is better than the expensive one. Great frying pans for the price. I’ve had them for the last 4 years in my food truck and they are still work awesome. Very glad I purchased them. These pans are perfect for our sauté dishes. The handle does not come loose even after repetitive use. Does not scratch and comes clean easily. Choice makes such a fantastic frying pan they’re built well and built to last we use this for many types of cooking needs and I would recommend these for all kinds of restaurants . This is the perfect size pan for any single serving size pasta dish. It is made of a god gage metal not to heavy bot not to lite. Great workhorse of a pan. I have yet to experience any problems with it. The quality is comparable to any of the competition with a significantly better price tag. This fry pan is great. I am happy to have this in my kitchen. I would recommend this to any one and every one I see. A good pan at a siper good price.i bought a case for the price the big box stores charge for 4. It's luke getting 2 for free. Box stores must be pulling their hair out. How can you possibly beat the price on these aluminum frying pans. I buy a bunch on every order and stock up. Really good quality for the price. I have tried a couple of the Choice non-stick aluminum frying pans earlier, and found them to be an excellent value. They were a very affordable product that functioned well beyond its modest price. Unfortunately, this pan was of lower quality. It looked superficially similar, but it had several scratches int he surface and a very difficult to remove sticker ( I needed to use a heat gun) on the cooking side. None of that was too big a deal at the price, but the pan also seemed to have issues with hot and cold spots, compared to its nonstick cousins. These 10" aluminum fry pans are the price is great and they are made well and will last a long time . We will definitely be purchasing more of these in the future. This 10" aluminum fry pan is really impressive. It heats and cooks nice and easily but then cleans up even easier. The value of this pan is fantastic. This item is a perfect fit for our restaurant and our kitchen staff loves them. They are very durable and cooking on them is perfect. This Choice ten inch Aluminum Fry Pan beyond impressed us. My wife has already picked out additional sizes for the next order. They can go straight into the oven without worry and offer a great no chip guarantee. Very well constructed and highly recommend. A very nice pan to cook with bought the rubber handle that goes with it and it has a good grip. Very easy to clean and it does not stick when the pan is very hot. happy with purchase. This fry pan is the perfect solution for quickly making fajitas, omelettes, pasta dishes, and everything in between! With a shallow, curved wall design and sturdy aluminum construction, this pan allows for easy stirring and prevents steam from forming in the pan. It is the best choice for me! The affordability for its quality is the best! Perfect size for quick orders and heats up fast too! Durable and very easy to clean! Very good pan! These are exactly what we'd hoped for when we ordered them. They are sturdy and easy to clean. We are happy to have these in multiple sizes. I can't imagine needing new ones since I know these will last, but when we do need to order- we will 100% order the same ones. How can you go wrong with 10' pan? This pan is great for our brunch omelet's as well as for sauteing our healthy chicken and shrimp lunch dish! These pans are the best for our business. They are perfect for the oven, and heat up really well. I certainly recommend these pans to any one. Choice 10" aluminum frying pan. It's a good basic frying pan. I don't know that I would reccommend it for heavy use but for my limited useage it works well. The choice 10 inch aluminum fry pan is a fantastic small frying pan, it heats up very well and holds temperature wonderfully. I would recommend this to anyone looking for a quality pan at a great price. Real affordable. The quality is excellent, they are very easy to clean. They definitely get really hot at the hands so make sure to use caution. The handles are real sturdy and never get lose. High quality for a reasonable price! You couldn't go wrong with this product. This is great for making omelets and it cleans up in a snap. I bought this fry pan thinking that it would be used a lot more, but, it didn't work out too well for me. I find food constantly sticks to it, the handle is not very comfortable, and while not completely terrible, the pan itself doesn't feel very nicely finished. I can see this pan being used in a restaurant environment where they're churning out food on a gas range. As for me, using the pan at home on a ceramic cook-top wasn't very fun. Instead, I've retired this pan to the camping equipment box where it will be used over a campfire. In terms of durability it feels solid, but I'd opt for a nicer set of pans to cook on inside the home. Great sped frying pan. Nothing fancy, just a workhouse meant to deal with the troubles of a fast paced kitchen. I have half dozen that were purchased a year ago ad they have held up very well. great quality fry pan, it has an even heat and the food with the rigth amoutn of oil it is really non stick. don forget to get the the fry pan handle to avoid getting burn with the handle. GREAT PAN FOR THIS PRICE! We have bought pots a few times from The Webstaurant Store and will keep coming back. They are very well made Our pots and pans get a workout and they hold up well. This 10" Aluminum pan has worked great in our kitchen. Don't let the price fool you. Its Extremely sturdy and durable. I will make this a staple supply in our kitchen. High quality and durable to hold up in a high volume restaurant. We have ordered several and will be reordering for our second location. You won't be disappointed. This pan is very sturdy. It has a great riveted handle, so it should last a long time without breaking. It provides good heat distribution. This pan would work great in a home environment as it is on the smaller size, however, we use it in the restaurant as well. Works great and is able to hold up to the high heat on our commercial stovetops. Great and affordable, this aluminum pan is so versatile in my kitchen. From a quick sear to moving items quickly to the oven, this pan looks great and is super light. I went back to aluminum after struggling with SS for so long and I'm glad I found this pan. Thanks! We needed more pans for sautee as we expanded our pastas and they are holding up very well. Handle still adhered strong and no signs of wear and tear thus far. NIce weight, long handle and arrived on time. The size is great for large portions and its easy to clean. Works best with the removable silicone sleeve 10". I can't seem to say enough good things about these fry pans. They have a nice weight to them and are extremely sturdy. I now use them in my home because they have worked out so well at work. This 10" Aluminum Fry Pan is durable and nice. The pan will stick when hot you have to keep oil in it. The price is great. Really like this Aluminum Fry Pan. The only thing that is not so good is that the Red Removable Silicone Pan Handle Grip slips off often. A nice sized saute pan that feel very sturdy. The fact that is all metal it can be used on top the range or in the oven. Great pan. Super bang for you buck here. have a good durability and work well for an inexpensive pan. Great for volume places and when you need a lot. Ordered a dozen of these pans a year ago. They've held up well and would not have expected to get such a great pan for such a low price. This aluminum fry pan is great! It's good quality and has held up well. It's easy to clean and easy to store. Overall great buy. Wow, what a bargain! I usually pay so much more for these in store. They are really good quality and seem like they will hold up overtime. All around great frying pan. I use this at the house and imagine it will last a lifetime. I have seared chicken breast, sauteed vegetables, shallow fried schnitzel, and caramelized onions in it and have had no issues. Hasn't warped and de-glazes great. Great pans for sauces and pastas made to order. We make homemade Alfredo and stir fry dishes. They are easily cleaned and a much for any commercial kitchen. Good standard heavy duty fry pan! No issues yet! I mean this design has been around for years, and the price from here is always good as usual. So you won't have any problems with these. Great 10" aluminum fry pan! Bought a couple of these and so far they work great. After reading some reviews I decided to get them. Great purchase. Great frying pan!! First of all, the price is unbeatable! The riveted handle is very Stong and the pan has a nice weight to it without being overly heavy. It is great for sauteeing vegetables among many other things and it puts a wonderful sear on meats! Highly recommend to anybody from a novice cook, to a restaurant chef. I will be buying the 12" as well very soon. This is an essential item in our kitchen as we have many saute dishes on the menu. We have many of these pans being used at the same time. We love that the handle has a hole for hanging and storage. They are extremely easy to clean as well. We LOVE these sautee pans. We bought them for sauteeing vegetables outside on our grill burner. They work great and are super easy to clean. The price could not be beat! These are nice pans. They are a nice weight, not too heavy to lift, but heavy enough to cook well. For the price we are very happy with these pans. I use fry pans more or than sauce pots at home so I need a wide variety of them I purchase two of every size. And all I can say is wow. Commercial goods are easier to clean than any thing I have had. As I do not have a automatic dishwasher. Thank you. Great price on these pans and I searched all over. Solid and well made they have held up well in a high volume kitchen. Easy to clean. Unbeatable value - a great quality product for a great price The pan performs nicely, cleans easily, is lightweight, versatile, and durable. You just can't beat the price for this kind of value. This is a very durable and sturdy pan. I love that I can do a nice sear on a piece of chicken and put the pan from the cook top to the oven. Purchased this item as part of our opening order. Have had them for about a month. Very surprised at the weight, thickness and quality of the item. Would definitely purchase again. i love to cook with these pan's they are strong and sturdy with no worping and it cook's sturfri excellent with no burnt on food. Great mid size aluminum fry pan. Very good price. Very sturdy handles that will not warp. Pan is very easy to clean. Another good bye from websturant. The aluminum fry pan is a great addition to our sautee line. They are easy to clean and store. They are made of quality material. This is one of the most amazing deals ever. I understand why places just buy these pans in lots. The fry pans are nice thick aluminum and heat up evenly and quickly. I have used this one for cooking everything from burgers to steak to chicken. It cleans up easy and doesn't have any hot spots. The pan works well on my gas and electric ranges. I am going to order the non-stick counterpart next for eggs. Great pan. Perfect for omelets or sauces. Very heavy duty...not like others in the price range that feel like they might melt. If your looking for a great in expensive fry pan look at these. Great pan to work with that gives you a durable use. Very easy to keep clean an take a everyday beating in the kitchen but keeps on going. This is a very durable and sturdy pan that heats up well and will withstand a lot of high heat. Good for searing and sauteeing. This is a really nice, heavy pan for very little money. We looked at pans at a number of local stores and could not touch this quality for the price. Great quality pan. Thick bottom, perfect small pan for cooking 1 or 2 portions. Good construction, we use it on our food truck and has held up great. This pan is incredibly good value for money. I use it at home on a regular basis and am extremely happy with it's performance - it heats up quickly and gets nice and hot for searing steaks, but is also responds quickly when I turn down the heat. With the metal handle the whole thing can go in the oven e.g. for finishing larger pieces of meat. No buckling so far, and although it's not non-stick it is pretty easy to clean. good size frying pan and a good value for it too. We have used them before and will reorder more when needed. Durable and effective. Heavy duty, for the serious home cook or the professional chef. These pans work great for everything, and at the price they are selling for you can afford to be a little rough with them. 90% of what I cook takes place in the 407fry pan. This is a very nice pan which holds the heat well. It makes awesome grilled cheese sandwiches! I'm very happy with this pan and the smaller 7" version. This ten inch pan is a wonderful product. It arrived in a timely fashion and in good condition despite a damaged shipping box. As advertised, a perfect sized, exceptionally performing cooking tool. This frying pan works wonders. Not only does its curved upward design allow for more space to cook, it allows items to slide accordingly based on what you need it to do. Cooking pork in the pan and letting the drippings come to the edge just so you can ladle it over the pork again and again. It is quite durable and the handle holds to the pan and doesn't shift in place. I gave one of these to my daughter who isn\\\\'t really a cook, and she said it made the best omelet she\\\\'d ever made. I did season it for her and gave it to her with a removable silicone handle to prevent hand burns. We bought these frying pans not knowing what to expect. We absolutely love them. They are solid and to a great job. We highly recommend these pans for the price! you cannot beat the value of these fry pans. We sautee heavily every night, and these pans can really withstand the heat. These pans are a great addition to the kitchen and webstaurant is practically giving them away at this price. Great product i use this commercial frying pan almost everyday and i love it. The pproduct is made great and the price was even better. I will order more. best size and ever for searing my protein or sautee vege. normally i use 10' pan for making small portion meal in my restaurant. the thickness of the pan can hold up heat very well. i needed a lot of pans when i opened my restaurant, and i was amazed at how much some sites were charging. these are incredibly durable, and half the price of others i've seen. thank you webstaurantstore.com! You can not be the price for a pan of this quality ANYWHERE on the web!! Webstaurant delivers with this commercial fry pan! Heats up quickly!!! Super convenient pans. We cater mostly and have power burners as opposed to standard ones. These fry pans are just the right minimum size to remain effective on the large burner surfaces. These are a nice quality durable saute pan. This is the kind that you want to stock up on so you never run out on a busy night. Great price. Item was exactly as they said - not a fancy, but very utilitarian piece, that got the job done. The price can't be beat. Highly recommend for those who can sacrifice the "pretty designer" pans and buy the real deal - ideal for restaurant use. we bought about 10 of it and use them to saute the side dish. after one and half years, no one of them is broken yet. good product! This is a very well made pan. I like the sturdy construction, but light enough that you can handle any cooked item with ease. However, remember to season the pan well in the oven prior to using or you will encounter a "sticky" situation. Last but certainly not least, this pan is FANTASTIC!! I purchased this along with the other pans for use at my home. This is a fantastic pan! I love the size and again, after seasoning it as directed, works fantastic! This is a great pan, and even greater value! It heats up really quickly, and feels great in your hand. Speaking of hands, watch that handle! It gets really hot too! i enjoy omelets and this pan has given me some of the best. this pan helps me to eat better prepared foods and also to be neater cooking. it is harder for me to cook with smaller pans, but a little butter or margarine is all i needed for this pan. Love these pans. We probably overheat them at times and cool them too quickly at others but they still hold up great. Would highly recommend them.